Portable generators can really save you in a power outage, but they can also kill you if they aren’t used properly. Generators create two potentially deadly elements: carbon monoxide and electricity. 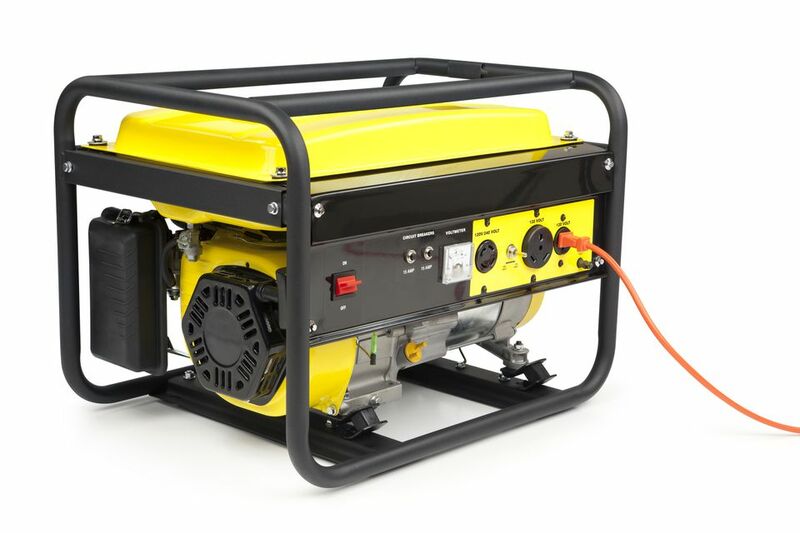 Accordingly, the two most important safety rules for portable generators is to run them where they are fully ventilated and to use their electrical power only as directed. In addition, safe refueling of a generator helps prevent a serious fire or explosion risk. All portable generators burn fossil fuels and create carbon monoxide (CO), a deadly colorless and odorless gas. For this reason, portable generators must be fully ventilated at all times when they are running. It is not safe to run a generator indoors or even in a garage unless the garage can be completely open for ventilation including multiple doors that open to provide cross-ventilation. Think of it this way: If a space isn’t safe for running a gas lawnmower or a car, it also is not safe for a portable generator. If a generator is outdoors near a door or window, make sure the door or window remains closed so that no exhaust from the generator gets indoors. Since you’re running your generator outdoors for safety, you’ll most likely need extension cords to bring power into the house. But it’s important to note that not all extension cords are equal. Just like the wiring in your home’s walls, cords have a limited capacity for carrying electricity. Heavy-duty cords with thick wires can handle more electricity than thinner cords. Length is another factor. A 25-foot cord offers a slightly higher capacity than a 100-foot cord with the same wire size. Using an undersized cord can overheat the cord, melt the cord insulation or plugs, and create a potential fire or shock hazard. The rule here is to use cords that can safely handle the electrical demand, or load, of the appliance of device, plugged into the cord. Electrical load is measured in watts. To run a 3,000-watt space heater, the cord must be rated for more than 3,000 watts. Cords are typically rated in amps (amperage) rather than watts. To convert from watts to amps, multiply the amperage by 120. For example, if the cord is rated for 12 amps, the total load capacity of the cord is 1,440 watts (12 x 120 = 1,440). However, it is best to reduce the total capacity by 20 percent, to find what is called the “safe capacity.” To make this calculation, simply multiply the wattage by 0.80. Therefore, the safe capacity for a 12-amp cord is: 1,440 x 0.80 = 1,152 watts. In addition to using the right size of cord for the electrical load, always use grounded, or 3-prong, extension cords with a portable generator. Grounded cords provide a safe path for electricity to follow in the event of a short circuit or other electrical hazards. Backfeeding a household circuit is the extremely dangerous practice of connecting a generator to an electrical outlet with a modified extension cord that has two male (pronged) plug ends. This energizes the entire circuit via the outlet, creating a serious fire hazard as well as a deadly shock hazard for utility workers working on power lines in the area. In the event of a power outage, utility workers assume all affected households have no power, but backfeeding introduces an unauthorized power source into the system, putting the workers at risk of electric shock. The only safe way to provide power to household outlets and hard-wired appliances is to use a manual transfer switch installed by an electrician. These switches cost around $1,200 to $1,500, including installation, and allow you to safely power a few select household circuits with a portable generator. Never add gas to a generator while it is running or when it is hot. Gasoline spilled onto a hot engine can ignite, creating an instantaneous fire and possibly an explosion. Before refueling a generator, turn off the motor and let it cool down completely, which may take 15 minutes or so. Going without power for 15 minutes won’t kill anyone, but a gas fire or explosion certain could.